Over the years I’ve added accessories to the garden, which cost just a few dollars . . . either because of having some luck, making it myself or fixing up a cast-off. Sometimes I had some mini disasters along the way, but in the end these whimsical additions enhanced the garden. 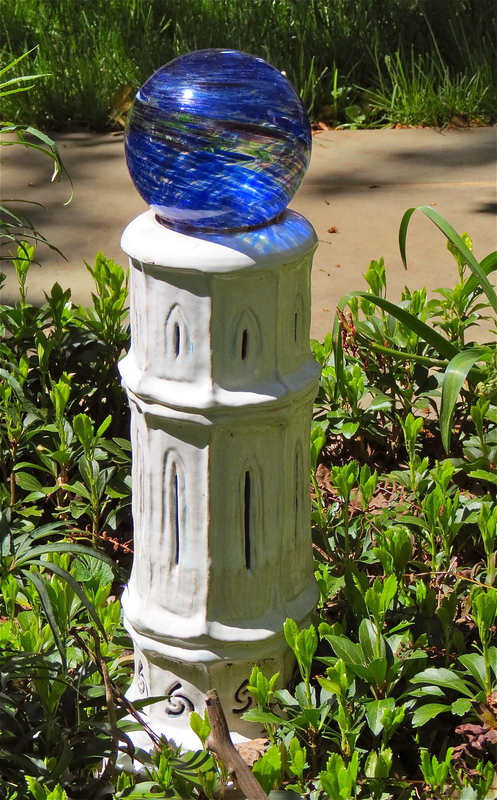 Gazing Ball Pedestal: When enrolled in a pottery course, I hand-built this stand for a gazing globe. The globe cost about $20 but unfortunately, I dropped the first one which fell into dozens of pieces. I guess it really cost me $40 as I had to buy a second one. The globe is supposed to give off a solar light, but because our lot is too shady for absorbing sunlight, it doesn’t really work. For all of its faults, I still like it. Sometimes I put colored lights inside the cylinder. Trellis: I found this trellis while hiking along a back road and saw a small part of it sticking out from under a pile of leaves. It took me a few minutes to pull it out from under the debris. Unfortunately, I didn’t realize that an ant colony had taken up residence inside the hollow metal, and the trunk of my car was swarming with the little guys by the time I arrived home. After shaking them out, I let it sit for a while before deciding where it should go. 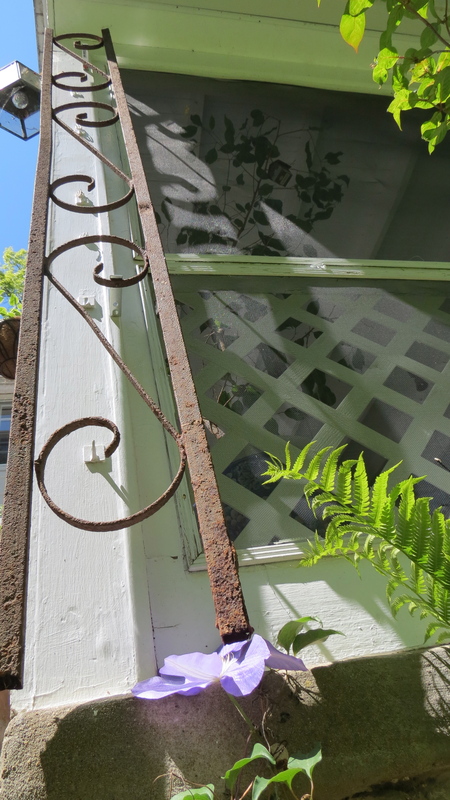 Purchased a clematis and attached the trellis to the side of the porch. 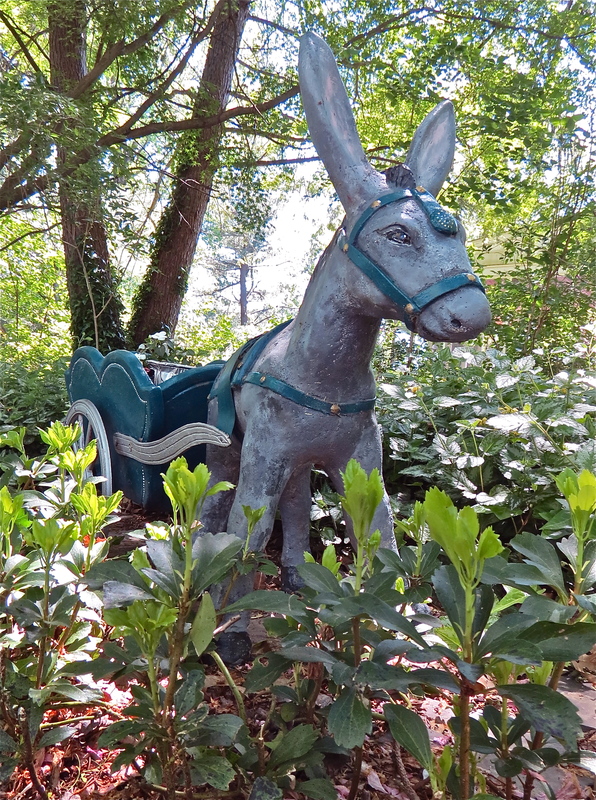 Donkey and Cart: This piece traveled through four states and found a new home when my parents moved to Pennsylvania. When they sold their house, we debated whether this kitschy and very heavy lawn ornament should just stay behind. The cement on the legs had totally deteriorated, and the paint was pealing off. I decided to keep it, and began the restoration including cementing the pieces back together even though I had no experience with cement. At first, the cement just oozed into pile instead of sticking to the iron core posts but eventually it dried out and began staying in place. Bench: This was another rescue from a family move. Rust covered the metal, and the top covered with mildew. 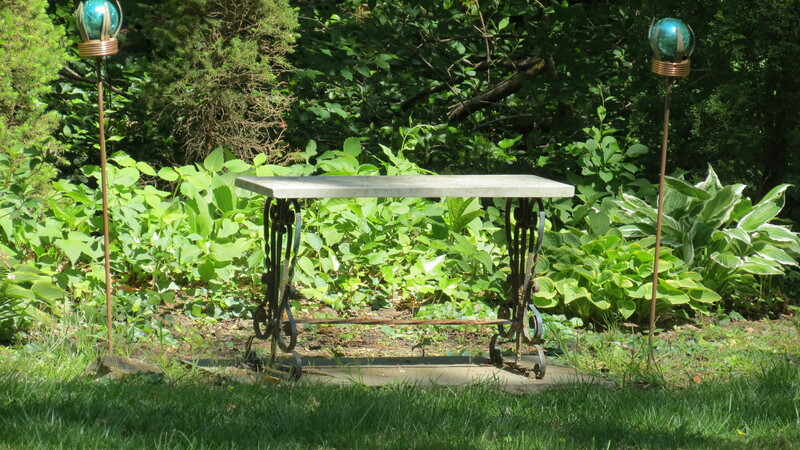 After scrapping the rust off, painting the stand and cleaning up the marble, the bench found a place in the side garden. I added a couple small ornaments and planted hostas on either side. Cider Press: Found this piece at a yard sale. After giving it a quick coat of stain and inserting a plant, it was ready for display. The press was not in the best condition to start with and the water flowing on the wood contributed to some decay, so I added a piece of clear plastic at the bottom, which has kept it intact now for ten years. 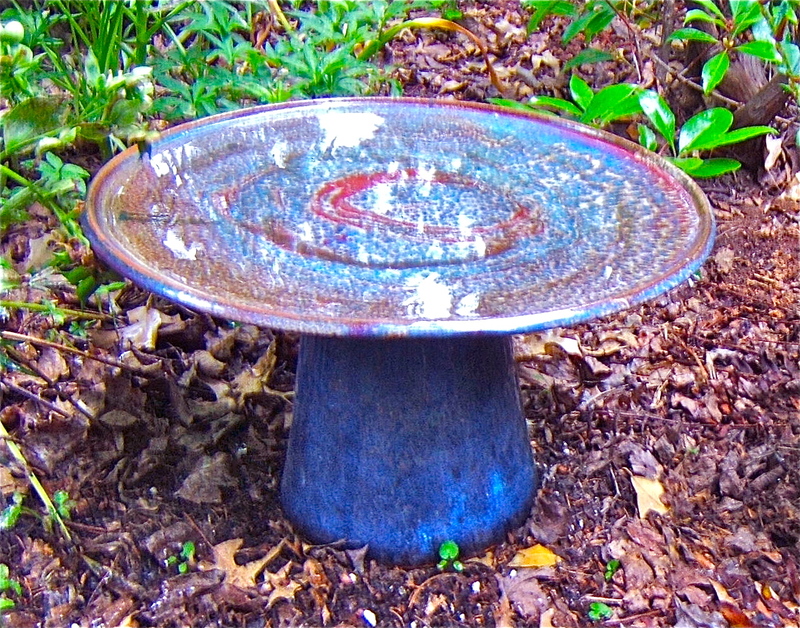 Bird bath: My pottery instructor was ready to throw this dish away because of a serious crack that ran along the bottom rim. The patterns in the glaze were beautiful, so I took it home to see what I might do with it. I used clear caulking to patch the crack and placed the plate on top of a pot. The caulk has held up well for several years now. Watering Can with Floating Spigot: Ok, this one cost me a few dollars, but I splurged for no other reason except the floating spigot looked cool. I once put it in one of the window display for Bindlestiff Books, and children would stare into the window wondering how the magic happened. 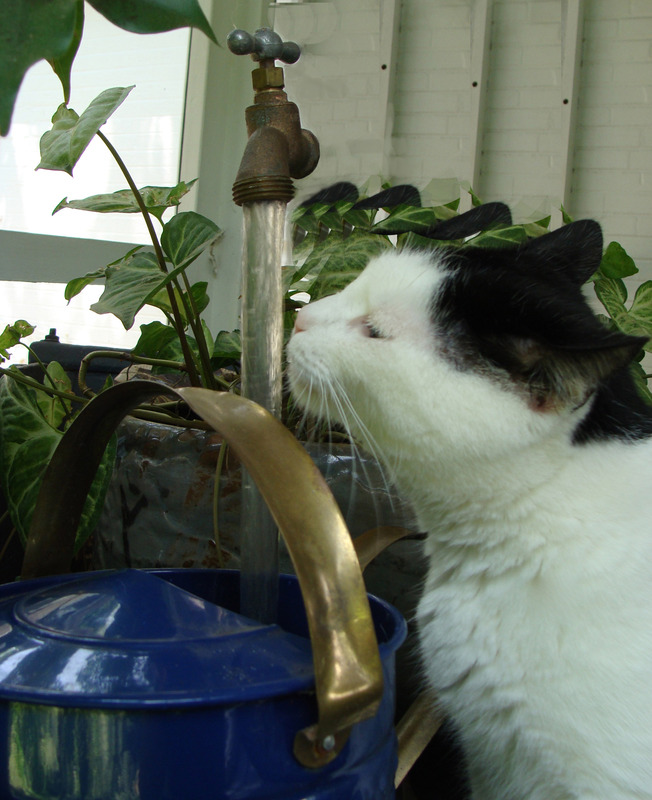 Kitty knows the magic of getting a drink of water from anything but her water bowl.